From summer sun to winter woes in the space of just a few days. Last week’s unseasonably good weather would have convinced the GAA’s fixture makers that they were getting away with squeezing so much Allianz League action into a very tight time-frame, but it turned out to be no more than an illusion which was banished in the space of a few hours yesterday morning. 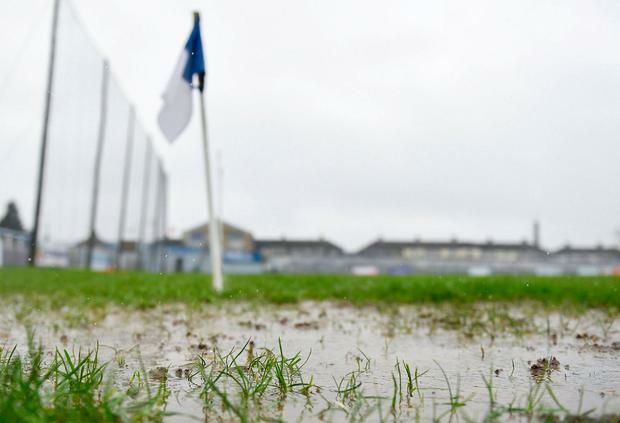 Torrential rain scratched two hurling 1A games and one 1B League game off the agenda, presenting Croke Park with a scheduling problem which will make it necessary to move the Division 1 hurling final from March 24. The Central Competitions Control Committee (CCCC) gambled on losing no games from the weekend before last until March 24. They knew from last year that it was very risky, but they did it anyway. In fairness, their options were limited. They are not allowed to start the Leagues before the last weekend in January and are under instructions to complete them by the end of March. In order to avoid having the Division 1 hurling and football finals on the same day, they staggered them over the last two Sundays in March. Yesterday’s unfortunate turn of events means that the hurling final cannot be played before the weekend of March 30/31. Having the hurling and football finals on the same weekend isn’t exactly smart from a promotional viewpoint, but that’s probably the least of the CCCC’s concerns. If they were to lose another weekend it would force one, or maybe even both finals, back to April 7. That happened in hurling last year when the Kilkenny v Tipperary final was played on the second Sunday in April. It takes no great insight to identify the root of the problem. Forcing so much action into the two months between late January and late March is ridiculously risky. The CCCC aren’t to blame for that, but they are in the frontline when it goes wrong. They are handed the broad parameters, which includes leaving April free of inter-county activity, so what are they to do? They jam almost 200 games into a two-month period, most of which is unsuitable for hurling. Everyone agrees it’s far from ideal, but there’s no choice if April is to be left free for club activity. Unless, of course, the Leagues started in October/November. The mere suggestion of returning to the days when three or four rounds of the League were played pre-Christmas will horrify some in the GAA, but is it such a daft idea? Provincial Club Championships dominate the October/November period, but since they involve relatively few county players, there’s no reason why the Leagues couldn’t get underway. If a few rounds were played at that time, it would leave far more room in the New Year. For a start, there would be no need to start the Leagues in January. And with fewer rounds to be played, it wouldn’t be necessary to stage them over so many successive weekends. So when a weather event – similar to what happened yesterday – hits the programme, there would be time to catch up, without impacting on the dates for the finals. Despite that, it’s unlikely that there will be a return to pre-Christmas League action. Counties are happy enough to train and play challenge games, but they would almost certainly baulk at League outings. That leaves it down to the weather gods, who can be in mischievous mood at this time of year, as they showed at short notice yesterday. There’s a growing feeling that the Leagues are being squeezed for no real return to the clubs. So if there’s no appetite for starting the Leagues in autumn, they have to be given some time in April. That was forced on the GAA last year and may well happen again. So why take a chance in the first place? It really would be a surprise if February and/or March didn’t deliver one bad weather event which forced the cancellation of some games. Since there’s so little room to manoeuvre, the chances of completing both finals in March are quite slim. And if the early part of the season weren’t busy enough, it also hosts the Sigerson and Fitzgibbon Cups, competitions which are being downgraded by being caught up in such a hectic whirl. Nothing changed after the chaos of last spring, which was put down to highly unusual weather events. All it took yesterday was heavy rain to wreck the programme and leave the CCCC again picking up the pieces. The end result will be that for a second successive year, the hurling League final won’t be played on the published date, which simply isn’t good enough for a major national competition.